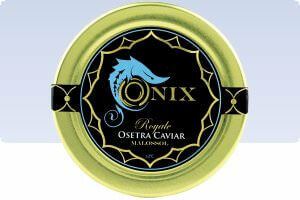 This Onix Royale Osetra caviar is a beautiful distinct black pearl with a smooth flavor. It is an Osetra caviar that is scarce, and it will be a great companion to the Imperial Osetra caviar with its golden pearls. The exclusive Onix Osetra is processed fresh under the guidance and full compliance to US regulations of the FDA and USDA.